Our friend Lou joined Mrs M Tours for the ‘Muscat in a day’ programme which had the effect of increasing the giggliness and squeakiness of the group. This was not one for the lads. 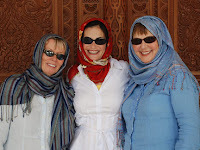 At the Grand Mosque, they enjoyed the dressing up. During the tour, Mrs M noticed another group of ladies being led by a palates acquaintance who was hosting Scottish friends that lived in Australia. They were apparently on a world tour. A gentleman from Kashmir charmed them into spending enormous amounts of money in his shop in the souq. More girlie shopping followed, including picture frames, runners, pendants and khanjars. I said this was not one for the lads. The group from the mosque were not far behind. Tired, hot and sweaty, the four Muscateers took lunch at the Marina....as did the group from the mosque. The day’s activities finished with a photo call at the palace. As the weather is still so wonderfully cool in the evening, we took April and Gail to the Shafaq barbeque which this week featured a particularly fine ratatouille. We did not notice the group from the mosque.